The U873R UniPoint hypercardioid condenser microphone offers smooth, accurate audio reproduction for handheld and fixed-mount applications. 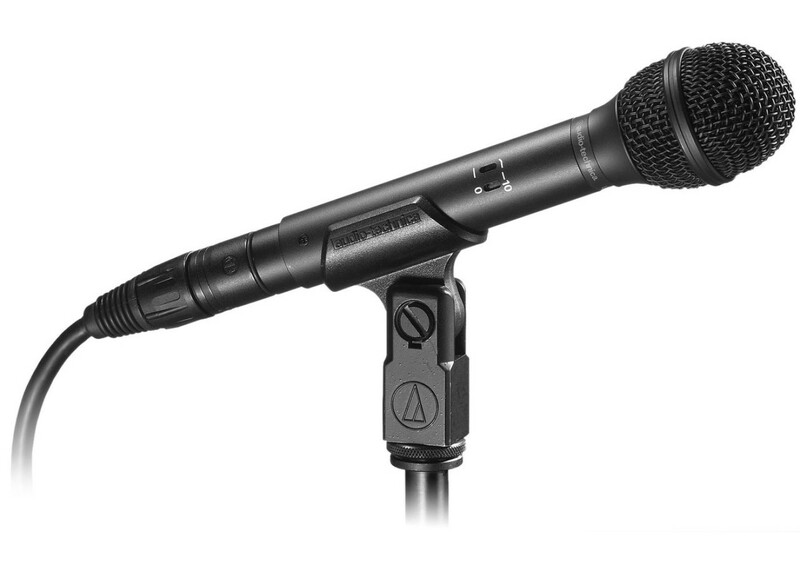 The microphone is equipped with A-T's UniGuard technology for unsurpassed immunity from radio frequency interference. It also features an 80 Hz UniSteep filter that reduces pickup of unwanted low-frequency ambient noise. The microphone's special internal shock mounting eliminates virtually all handling and cable noise. Designed for distortion-free output even in intense sound fields, interchangeable elements (cardioid, hypercardioid and omnidirectional) permit selection of angle-of-acceptance from 100"
5 Microphones and 3 Stands Bag..